In his first teletown hall of the year, Rep. Greg Gianforte on Wednesday said he never would have worked without pay in the private sector, as is currently the case with 800,000 federal workers now stuck in the 26th day of a government shutdown. But the state’s only member of the U.S. House stated his support for President Donald Trump and his position on the southern U.S. border, adding that he would visit the border personally in the weeks ahead. It took 4 minutes and 30 seconds for the border and government shutdown to come up in Wednesday’s call, which was open to informed members of the public. Gianfore said the nation’s border has been open for too long. As a result, Mexican meth is pouring into Montana communities and tearing families apart. He said he spoke with a Montana sheriff who said 90 percent of his crimes were directly related to addiction, burglary, vandalism, domestic violence and kids in foster care. Gianforte attributed that later figure to Doctors Without Borders. Last year, he said, U.S. Border Patrol agents arrested 17,000 people at the southern border with a criminal record, including 800 gang members. As to the government shutdown, Gianfore said Trump has been clear in saying he will only sign a bill that includes funding for a “visible barrier,” including “a wall” to secure the border. He blamed Rep. Nancy Pelosi for what’s now the longest shutdown in U.S. history. Republicans run both the Senate and White House. The shutdown began while the GOP also dominated the House. With the exception of Sen. Jon Tester, Montana’s congressional delegation has taken to staged phone hearings as a way to field questions from constituents. It’s a shift from years past when members of Congress actually faced audiences head on. Given the current strategy of teletown halls, it’s impossible to observe the integrity of the calls coming in, or whether they’re staged as puff-ball questions. Most callers are only identified on a first-name basis, such as “Candy” and “George,” who were afforded the chance to ask questions on Wednesday. The media was invited to listen in, but not ask questions. Wednesday’s call also included an impromptu survey of those on the phone regarding the most important issue facing America. 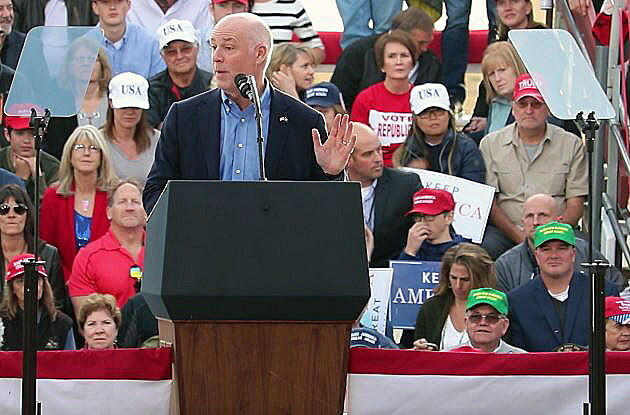 The five choices offered by Gianforte included the federal debt, the economy and jobs, border security and the wall, national security and the military, health care, and veterans. The results placed border security as listeners’ number one concern, followed by the national debt and health care.